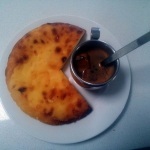 Swedish Coffee Cheese (Kaffeost), also known as Finnish Squeaky Cheese (leipäjuusto) is a magical little LCHF wonder. It’s a fat bomb to add to your espresso that makes it taste like tiramisu. KaffeOst is a fairly ordinary tasting simple cheese. But when pieces are dropped into a cup of coffee, it does something truly magic. It makes a simple espresso taste like Tiramisu - making a cup of coffee into a LCHF dessert. Add rennet, and stir with a slotted spoon for 30 secs. Then let stand 15 minutes until the curds have set. Using a long knife slice the curds into 1cm cubes, to allow whey to separate from the curds. Place the colander over a bowl to catch the whey, and place a piece of dampened muslin cloth in the colander and and spoon the curds in allowing the whey to escape into the bowl. Leave in the refrigerator overnight for the whey to completely separate. Preheat an oven to 200° Celsius. Pour the curds into an ovenproof dish about 15 cm in diameter and bake in the oven for about 40 minutes. Allow to cool in the pan before refrigerating. Slice the wheel of cheese into 16 wedges and serve in a good coffee.